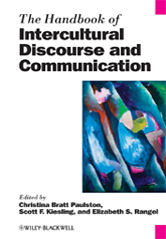 Editor/Author Bratt Paulston, Christina, Kiesling, Scott F. and Rangel, Elizabeth S.
The Handbook of Intercultural Discourse and Communication brings together internationally-renowned scholars from a range of fields to survey the theoretical perspectives and applied work, including example analyses, in this burgeoning area of linguistics. Features contributions from established researchers in sociolinguistics and intercultural discourse. Explores the theoretical perspectives underlying work in the field. Examines the history of the field, work in cross-cultural communication, and features of discourse. Establishes the scope of this interdisciplinary field of study. Includes coverage on individual linguistic features, such as indirectness and politeness, as well as sample analyses of IDC exchanges.